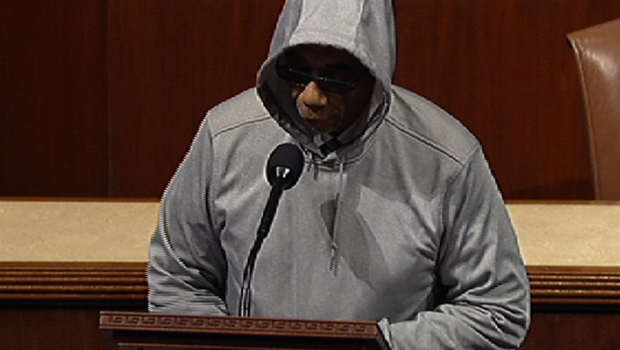 Democratic Rep. Bobby Rush, of Illinois, was escorted off of the House floor on Wednesday after donning a hoodie and sunglasses in honor of slain teenager Trayvon Martin. At this point, Rep. Gregg Harper, a Republican congressman from Mississippi who was serving as the presiding speaker of the chamber, called Rush out of order. Rush continued reading a passage from the Bible before being escorted out of the chamber. The hoodie has become something of a symbol during the national outcry which has followed Martin's death, especially among those who think the killing was racially tinged. Since then, protesters across the nation have joined in various so-called "Million Hoodie Marches" calling for justice for Martin's death and decrying racial profiling in America. Several members of the Miami Heat NBA basketball team also recently posed for a photo in hoodies, heads bowed, in tribute to Martin. Yesterday, Martin's parents attended a House judiciary forum in Washington, D.C., in which Democratic lawmakers called for Congress to pass stronger laws prohibiting racial profiling, and urged state legislatures to repeal the so-called "Stand Your Ground" laws which have come under intense scrutiny in light of Martin's death. Rush's office declined to comment on the incident further to CBS News.